Our beloved Ronda Lynn (Johnson) Woods passed away on March 17, 2019 at Falls of Rough, Kentucky, after fighting the toughest fight of her life with colon cancer since 2012. She was born June 24, 1965 in Louisville, Kentucky, the daughter of William and Frances (hayes) Johnson; and the sister of Renae (Ernie) Polensky, Dwayne (Laura) Comstock, and Deanna (Larry) Robertson. She grew up in many different cities and states throughout her childhood, and attended high school in Roundup, MT, graduating in 1983. As a young adult, she moved to California where she married Russell Corey Miller, and had three beautiful children. In 1997 her and her family moved back to Louisville, KY where she lived out her passion of taking care of and teaching children. She then drove a school bus for Jefferson County and then Meade County Schools until 2014. She tirelessly took care of her late husband Russell Miller until he passed away in 2011. 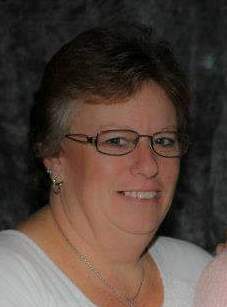 She was always active in her kids’ lives, helping with their schooling, sports and activities. On June 15, 2013 she was united in marriage with Clyde Woods, Jr. in Ekron, KY where they resided until her death. She was blessed with 10 grandchildren and 3 great grandchildren, and she was happiest when she was in their presence. She loved the outdoors and letting the wind tousle her hair when she was on her trike. She also enjoyed relaxing by the lake at Rough River. Ronda never let a holiday go by that she didn’t want to have a party and enjoy all of her friends and family. Ronda is survived by her mother, Frances L. Johnson, Ekron, KY; her husband, Clyde Woods, Jr., Ekron, KY; two sons, Kieran (Tessa) Miller of Elizabethtown, KY and Ryan (Sharon) Miller of Evans Mills, NY; and a daughter, Shelby Gonsalves of Ekron, KY; two step daughters, Jennifer (Michael) Hunt of Vine Grove, KY and Dellaney (Brian) Priddy of Ekron, KY; ten grandchildren, Alex, Adam, Austin, Dylan, Markus, Keira, Peyton, Preslee, Frankie, and Daniel; and three great grandchildren, Nathaniel, Tommy, and Evangelina; two sisters, Renae (Ernie) Polensky and Deanna (Larry) Robertson; and one brother, Dwayne (Laura) Comstock. Ronda is preceded in death by her father, William E. Johnson; and her husband, Russell C. Miller. Funeral services will be held at 11:00 AM on Thursday, March 21, 2019, at the Ekron Baptist Church, with Barry Franke officiating. Burial will follow in the church cemetery. Visitation will be held from 2:00 until 8:00 PM on Wednesday at the chapel of the Hager Funeral Home. In lieu of flowers, expressions of sympathy may take the form of contributions to St. Jude Children’s Research Hospital.